My name is Liliana Oliveros. I have a muscular dystrophy. 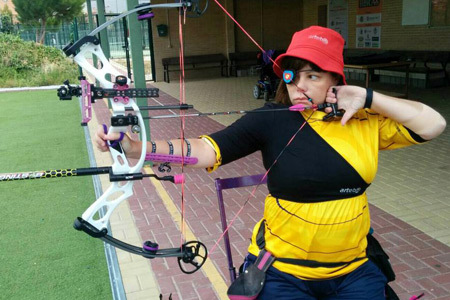 I started in archery in 2014, competing for Madrid´s Community in regional tournaments and national championships. At the end of 2014 I started training with a professional coach, Elias Cuesta Cobo, with the aim to be part of the Spanish Paralympic Archery Team in 2015. I got this objective and I am currently part of the Spanish Paralympic Archery Team. In my first international tournament (Dutch Para Archery Tournament in May 2015) I got the silver medal in my category; Compound/Recurve W1 women and in the World Para Archery Championship held in Germany in August I finished in 5th place and I've got a place for the Paralympic Games in Rio 2016. From October 1, 2015 I will come in to take part as beneficiary of the ADOP Rio 2016 plan, year 2015, which is a plan of support to the Spanish Paralympic athlete promoted by the Spanish Paralympic Committee. I begin a new training season with a clear goal, give the best of my in Rio 2016 Paralympic Games! !